Travel planning for me is at once an exercise in imagination and restraint. I have to be forcefully focused in how I approach my daily research in order to make concrete plans, because reading about how to get from Klaipėda to Riga can quickly turn into wild desires to visit Cape Kolka during my limited schedule and then dreaming about spending months bicycling through the Baltics. Weeks turn into simply not enough time. The more I learn, the more I want to see for myself. Hey world, you’re making me ravenous. Given my propensity for distracting myself with ever more grandiose plans, travel research becomes my primary activity, and it occupies by far the most brain space. I can connect almost anything I do to travel planning. Reading? Well, just look at some of the books I’ve recently finished. Using social media? Oh, you know, I’m mostly pestering friends about my travels. Studying? Yes, I’m years done with school, but I’m reviewing my old Russian textbooks. Exercising? I want to be fit for hiking and biking. Daydreaming? You bet I’m already fantasizing about breakfast during my layover in the Helsinki-Vantaa airport (I’ll be eating karjalanpiirakat, of course). Internet browsing? I’m mostly reading some great travel blogs (and yes, now I’ve decided I want to bike around the Ladakh region of India too). I am doing some more serious logistical preparations too, lest you think all my time is consumed by learning about ever more places and adding them to my long to-visit-sometime list. I’ve been on the phone, buying plane tickets with my friend. I just registered for an airline rewards program, because I probably shouldn’t waste miles from flying over halfway around the world. I’m browsing BeWelcome, looking for potential hosts to reach out to. I’m making to do lists (call my bank, get a few camping supplies, actually purchase that travel insurance). 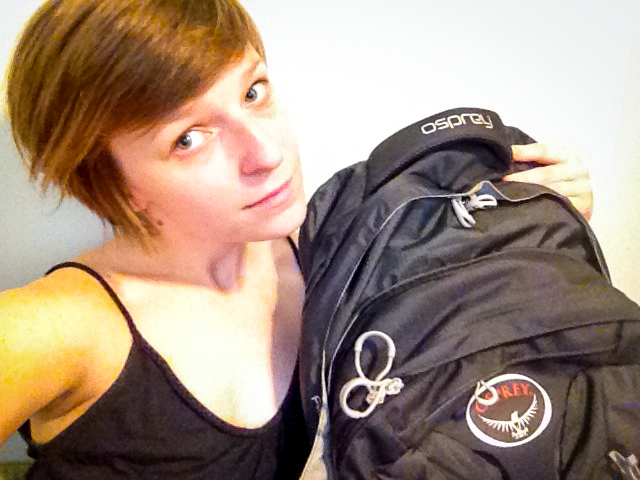 I’ve acquired my newest travel companion, a nice, proper, comfortable travel backpack. A silly selfie with my new travel companion. All of this is terribly exciting. Exciting because of obvious reasons. Terribly so, because I’m really eager but also feel insatiable. Everywhere is so interesting! I want to visit every random place I hear about in every tiny and enormous country I am visiting! Never mind that my money and time are somewhat limited. There’s always a next time, but there’s always a million other destinations. It’s overwhelming, and it’s exhilarating. Curiosity made the girl anxious, and it made her go far. I’ll be abroad in exactly one month. Here’s where I’m going: Russia (Lake Baikal), Lithuania, Latvia, Estonia, and Finland. Five weeks abroad, then hopefully some domestic travel. And then: securing a new job that hopefully allows me to continue to pursue my environmental and international interests. Big times ahead. Live your life at fullest; the way you have decided it to be :) Travel the world around, rod a bike and do whatever you feel like. Just don’t let this adventurous spirit take a break. I am sure you will do miracles in life. Thanks for sharing a fantastic post! Thanks for reading, and thanks for the encouragement! Wow! I’m so jealous about your travel plans. Hope to read about your experiences in those countries… till I can visit them myself (sometime!) I’m like you – the more I read about places, the more I want to visit… and the less time it seems I have, to do all of that. The title of your post is fantastic and bang on! Thank you! I’ll definitely be writing here about my upcoming experiences. Here’s to us curious people and to adventures for the both of us!